This Spinach Artichoke dip is not only delicious but everyone’s favorite. 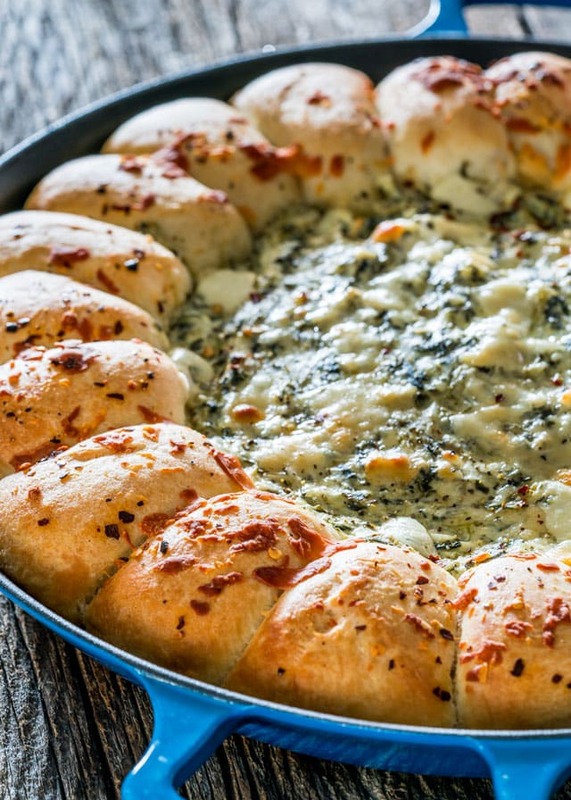 We’re talking gooey cheesy goodness surrounded by bread rolls, all baked in one skillet. Plop it on a table and let everyone dig in. 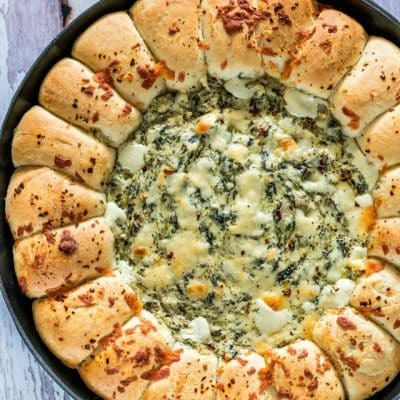 My favorite way to have spinach artichoke dip is in a skillet with the cheesy dip in the middle surrounded by bread rolls. The great thing about this is that it’s all baked together. Yeah, baby! It’s super easy to make with frozen dinner rolls. You don’t even need to thaw them out first. Just arrange them in the skillet frozen then let them proof until they double in size. They will thaw out as they proof. This really is super easy to make, and such a crowd favorite. The main ingredients are, obviously, spinach, artichokes and cheese. I use a variety of cheeses such as cream cheese, mozzarella cheese and Parmesan cheese. I also love to add some sour cream and mayonnaise. The rest of the ingredients are the spices and I keep it simple with just salt, pepper and a bit of red chili flakes. Spray a large skillet with cooking spray or brush it with some melted butter. 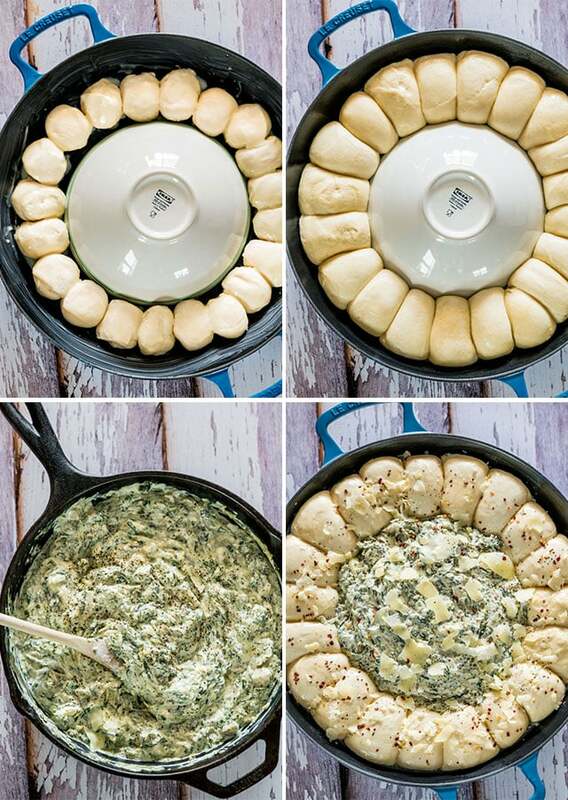 If you’re using frozen rolls, arrange them around the outside of the skillet. Take a small bowl that’s about 5 inches in diameter and place it top side down in the center, as seen in the pictures. This will keep the rolls from spreading too much and it will leave you with plenty of room for the dip. This time I decided to cook the dip ingredients a bit first in a skillet. I do this to melt all the cheese but it really isn’t necessary if you don’t want to dirty another skillet. Just combine everything together in a bowl, that should work just fine. Remove the bowl from the center of the skillet and add the dip into the center. Bake for about 20 to 25 minutes until the rolls are golden brown and the dip is nice and bubbly. 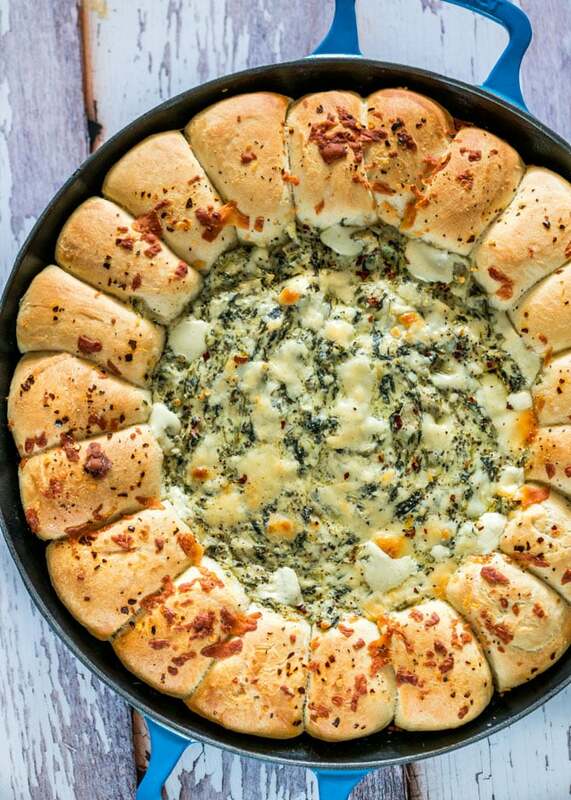 This Spinach Artichoke dip is not only delicious but everyone's favorite. 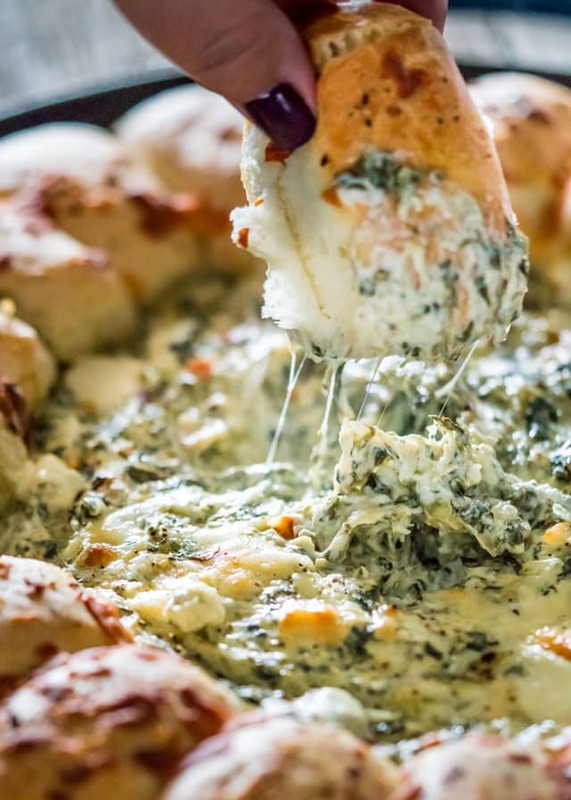 We're talking gooey cheesy goodness surrounded by bread rolls, all baked in one skillet. Plop it on a table and let everyone dig in. Spray a large skillet with cooking spray or brush with melted butter. Take a small bowl that's about 5 inches in diameter across the top and place it top side down, in the center of the skillet. Spray this bowl with cooking spray as well. Take the bread rolls and arrange around the outside of the skillet. You might have to push them together to fit them all. Brush with melted butter then cover with plastic wrap and let the bread rolls rise until doubled in size in a warm spot, about half hour to an hour. Remove the bowl from the center of the skillet and pour the dip into the center. Sprinkle the top of the dip and bread rolls with chili flakes and additional Parmesan cheese, if preferred. Place the skillet in the oven and bake for about 20 to 25 minutes or until the rolls are golden brown and the dip is bubbly. Feel free to use fresh instead of frozen spinach. You can prepare this recipe the day before you need it. Follow steps 1, 2 &3, cover in the fridge with plastic wrap, and bake right before serving. Nutritional information is just an estimate as it can vary drastically depending on brands and products used. I love your recipes, have tried quite a few . Can you include low carbs and sugar free ? Got to cut my carbs down. 😥 Thank you so much . Hi Mary! Check this section out for some healthier options. Yum Yum. The rolls we found at our local grocer tasted so so good with this recipe. Almost like a pastry. I make monkey bread for my church. I prep it all and put it in the oven, right at 10:30, and just before 11am service, I turn the oven off, and let it sit and keep warm. During communion, I take it out, invert it and it is ready for coffee hour, perfectly done and still warm. In your opinion, would this recipe hold up the same way, with either frozen rolls or the Grands? Are there any other recipes, savory or sweet which would work well for my coffee hour? Yes that will work! Depending on how long your service is, you might have to turn the oven back on for a few minutes to make sure it’s nice and creamy. Try these sweet chicken bacon bites for something savory! A trifle would also be great, then you wouldn’t have to even touch the oven. I simply love your recipes! The skillet bread, French Onion soup andseveral others have been a hit with both friends and family! Could I use Pillsbury Grande biscuits instead of frozen rolls? It’s impossible to find in NYC! Yes you can! That will taste great. How do you think this would turn out if I used fresh opposed to frozen spinach? Fresh spinach would work just as well! After I figure out the fresh to frozen ratio, I’ll have to give that a try! I have tried it both ways and prefer fresh over frozen spinach. The only issue that I had is that the bread (dough) that was touching the dip remained doughy. I baked for about 20 minutes. I’ll have to try it again but keep it in the oven longer….and I would definitely like to try this again =-D! Your site makes me want to have more gatherings so I can have an excuse to try more recipes (I can’t eat all this food by myself)! I made this for New Years Eve but used Pillsbury French bread cut and placed around the pan like the rolls. Super yummy! Ate the left over dip with Tostitos. Yeah, that’s a great idea, I would just place plastic wrap over the dip, right on the dip and refrigerate it. Yes you can, at 400 F for about 15 min. Can you make this in a pie dish? Looks so yummy!!! Sure as long as it’s big enough. Hi again. Duh, I just read your whole blog…yes, thaw them first or not….Thanks!!!! I’m wondering if you thaw the bread rolls first?????? 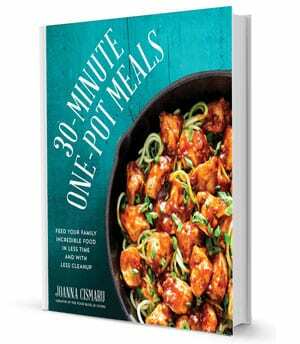 Can’t wait to make this! This just made the Super Bowl party menu this weekend! Can’t wait to try it! One question though…the link to Amazon for the skillet used lists a pan that costs $249, but you mentioned in a reply that you have one that cost around $20-30…can you clarify please? And is this a cast iron skillet or a porcelain skillet? The link I see is to a cast iron skillet that costs 32.93. I think it depends where you shop, you can find them cheaper probably in some places. The one in the picture though is really a paella cast iron pan and that one is 249.95 on amazon. What size is the skillet you used, I’m not sure mine is large enough. Mine is a Le Creuset Paella pan I used here 13.5 x 11 x 1.8 inch cast iron skillet. You can see it here. Jo, you don’t need to post this note, it’s just a quick message to let you know that you somehow forgot to mention when the spinach goes in. I figured, with everything else, but thought I’d let you know in case you want to add it to the steps 🙂 I am one of those OCD people who have all the ingredients in cute little bowls and, because I rely 100% on instructions, as otherwise I would mess things up, I found myself left with the spinach, scratching my head wondering what to do with it, lol. I have to say, though, as I cook more and more of your recipes, I am getting more and more confident, like I did this time, having to use my head – it only made sense for the spinach to go into the yummy gooey cheesy mixture 🙂 Delicious! 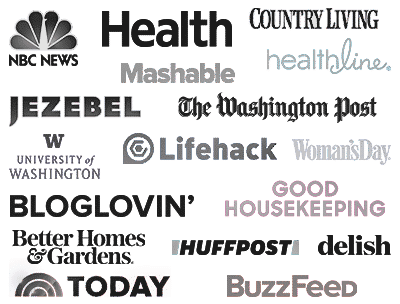 I need to go out more!… Before your recipe, I had never even heard of pull apart bread, lol! A few days ago I was searching for an easy and tasty appetizer for a dinner party, and thought I’d try this one. My only hesitation was that, to my shame, we don’t have a skillet like this one. I ended up using a rectangular baking dish, and it worked perfectly nonetheless. Our friends loved it and finished it in no time 🙂 It was a huge hit! While they were fighting over it, I actually had to remind them to save room for the main course and dessert – but they still cleaned up the dish, hehe. Your presentation, however, looks amazing, so this Christmas I’ll ask hubby for a few kitchen items we need, including a skillet like yours. This recipe looks so rustic served in the skillet it was prepared in! I’ve made it three times now, so yummy, and so incredibly easy to make! These skillets are perfect, and this one wasn’t that expensive either, I think it was between $20 and $30, you’ll love it! Freakin’ CLEVER! Ive made this spinach/artichoke dip before but always served slices of toasted baguette on the side. I L.O.V.E. this new presentation!!! Thanks for sharing!! My pleasure, so glad you liked it! You have me droolin’ every single time I stop by! Which is pretty much every day at this point. It’s whatevs. But for real, this looks amazing. The perfect dish for parties and football season! Thanks Karly! This is one of my favorite dips, been making this for years and years, it’s a favorite when friends come around.